The New England Classic® Fine Wood Panel System is a bold new concept in wainscot and wall covering. It uses the highest quality veneers and engineered wood materials to deliver a product of impeccable beauty and lasting quality. The Fine Wood Panel System is available in these distinct styles that recreate the authentic spirit and mood of the finest architectural and decorative styles of America and Europe. These unique panel styles allow you to achieve the style, decor, and mood you want in each room of your home. 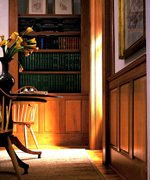 View or download the New England Classic Wood Wainscot and Wall Panel System Brochure. Raised panels tracing their heritage back to the 17th-century Colonial period. Beadboard panels that mirror 19th-century Victorian, English Country, and Cottage design movements. Recessed flat panels - honoring the American design innovations of 19th- and 20th-century Shaker, Mission, Prairie, and Arts & Craft styles. A refined casual cottage paneling style inspired by the ‘utilitarian’ architecture of the late 19th and early 20th centuries. 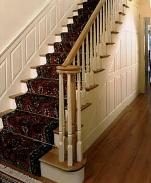 Traditional or Flat panel wainscoting transforms your stairway into a focal point of interest and character.